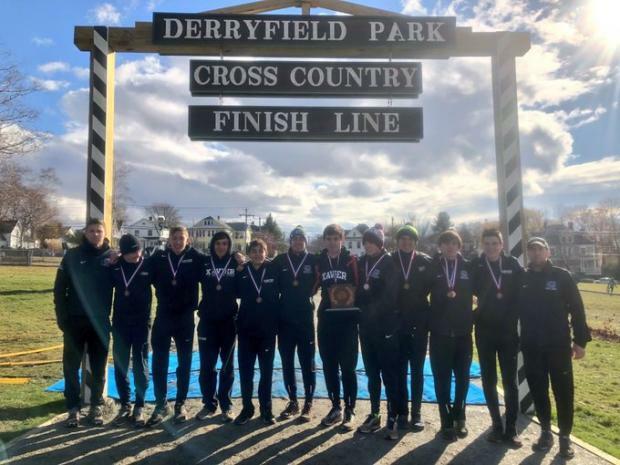 One was a surprise and one was expected, but Connecticut athletes swept both boys and girls individual titles at the 84th Annual New England Cross Country Championship at Derryfield Park in Manchester, New Hampshire. Trey Cormier of Hall High School in West Hartford and Pomperaug's Kate Wiser came away with the wins on this rain soaked course that is one of the toughest in the region. Cormier had a simple game plan according to his coach, Jeff Billing. "Just get out in the front and run hard for 16 minutes". The senior, who just committed to run for Dartmouth next year, was in the lead by the mile marker which he went through in 5:05. He then pushed the pace up the ski slope mountain and returned with a five second lead. Cormier, a 9:08 3200m runner was injured most of the fall but came back in time to run the Wickham Invitational five weeks ago and finished 9th in the Championship race. In just 35 short days, he worked his way up to winning his first New England title with a personal record time of 15:56.6 over 5000m. Cormier maintained that five second lead until the last 200m when freshman Gavin Sherry of cross town rival Conard started his mad dash to the finish and narrowed the gap to .7 seconds to become New England runner up in his first season of high school running. 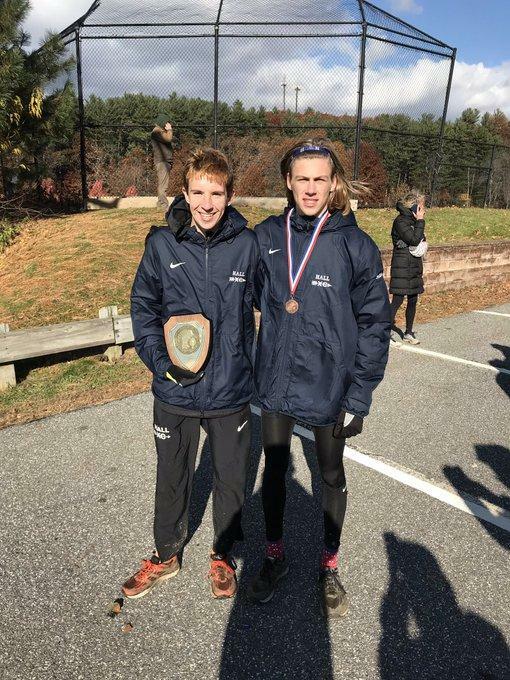 Connecticut had six other All New England finishers with Xavier's duo of Robbie Cozean and Dillon Selfors taking 9th and 10th, Cormier's teammate Miller Anderson, who just committed to Villanova in 12th, Old Saybrook's first New England qualifier Shane Henderson taking 19th, Amity's Connor Visnic in 23rd and Eddie Nicholas holding on for 24th place becoming Nonnewaug's first All New England boy cross country runner. LaSalle of Rhode Island mildly upset Rhode Island team champion Bishop Hendricken 49- 80. This gives LaSalle their 9th New England title to Hendricken's All Time leading 13 titles. Last year champion, Xavier still came home with a trophy and took 3rd place behind the efforts of Cozean, Selfors, senior Peter Schulten in 26th, fellow senior William Curran in 39th and freshman Eamon Burke in 69th. Hall High School had their highest finish ever at New Englands with a 4th place finish and Connecticut teams took the next two spots with Staples taking 5th and Suffield 6th in their first ever New England appearance. Tolland was the fifth Nutmeg team in the top ten and Danbury High rounded out the in state teams with a 14th place finish.